Written by Ta-Nehisi Coates. Art and Cover by Daniel Acuna. A NEW DIRECTION FROM TA-NEHISI COATES & DANIEL ACUñA! A bold new direction for the Black Panther! For years, T'Challa has fought off invaders from his homeland, protecting Wakanda from everything from meddling governments to long-lost gods. Now, he will discover that Wakanda is much bigger than he ever dreamed… Across the vast Multiverse lies an empire founded in T'Challa's name. Readers caught a glimpse of it in MARVEL LEGACY #1. Now find out the truth behind the Intergalactic Empire of Wakanda! Ta-Nehisi Coates welcomes aboard fan-favorite artist Daniel Acuña for a Black Panther story unlike any other! 36 pages, full color. Rated T Cover price $4.99. Limited 1 for 25 Retailer Incentive Variant Cover. Written by Ta-Nehisi Coates. Art by Daniel Acuna. Cover by In-Hyuk Lee. A NEW DIRECTION FROM TA-NEHISI COATES & DANIEL ACUñA! A bold new direction for the Black Panther! For years, T'Challa has fought off invaders from his homeland, protecting Wakanda from everything from meddling governments to long-lost gods. Now, he will discover that Wakanda is much bigger than he ever dreamed… Across the vast Multiverse lies an empire founded in T'Challa's name. Readers caught a glimpse of it in MARVEL LEGACY #1. Now find out the truth behind the Intergalactic Empire of Wakanda! Ta-Nehisi Coates welcomes aboard fan-favorite artist Daniel Acuña for a Black Panther story unlike any other! 36 pages, full color. Rated T Cover price $4.99. Limited 1 for 10 Retailer Incentive Variant Cover. Written by Ta-Nehisi Coates. Art by Daniel Acuna. Cover by Yasmine Putri. A NEW DIRECTION FROM TA-NEHISI COATES & DANIEL ACUñA! A bold new direction for the Black Panther! For years, T'Challa has fought off invaders from his homeland, protecting Wakanda from everything from meddling governments to long-lost gods. Now, he will discover that Wakanda is much bigger than he ever dreamed… Across the vast Multiverse lies an empire founded in T'Challa's name. Readers caught a glimpse of it in MARVEL LEGACY #1. Now find out the truth behind the Intergalactic Empire of Wakanda! Ta-Nehisi Coates welcomes aboard fan-favorite artist Daniel Acuña for a Black Panther story unlike any other! 36 pages, full color. Rated T Cover price $4.99. Written by Ta-Nehisi Coates. Art by Daniel Acuna. Cover by Artgerm. A NEW DIRECTION FROM TA-NEHISI COATES & DANIEL ACUñA! A bold new direction for the Black Panther! For years, T'Challa has fought off invaders from his homeland, protecting Wakanda from everything from meddling governments to long-lost gods. Now, he will discover that Wakanda is much bigger than he ever dreamed… Across the vast Multiverse lies an empire founded in T'Challa's name. Readers caught a glimpse of it in MARVEL LEGACY #1. Now find out the truth behind the Intergalactic Empire of Wakanda! Ta-Nehisi Coates welcomes aboard fan-favorite artist Daniel Acuña for a Black Panther story unlike any other! 36 pages, full color. Rated T Cover price $4.99. Limited 1 for 100 Retailer Incentive Variant Cover. Written by Ta-Nehisi Coates. Art by Daniel Acuna. Cover by Artgerm. A NEW DIRECTION FROM TA-NEHISI COATES & DANIEL ACUñA! A bold new direction for the Black Panther! For years, T'Challa has fought off invaders from his homeland, protecting Wakanda from everything from meddling governments to long-lost gods. Now, he will discover that Wakanda is much bigger than he ever dreamed… Across the vast Multiverse lies an empire founded in T'Challa's name. Readers caught a glimpse of it in MARVEL LEGACY #1. Now find out the truth behind the Intergalactic Empire of Wakanda! Ta-Nehisi Coates welcomes aboard fan-favorite artist Daniel Acuña for a Black Panther story unlike any other! 36 pages, full color. Rated T Cover price $4.99. Limited 1 for 500 Retailer Incentive Variant Cover. Written by Ta-Nehisi Coates. Art by Daniel Acuna. Cover by Jack Kirby. A NEW DIRECTION FROM TA-NEHISI COATES & DANIEL ACUñA! A bold new direction for the Black Panther! For years, T'Challa has fought off invaders from his homeland, protecting Wakanda from everything from meddling governments to long-lost gods. Now, he will discover that Wakanda is much bigger than he ever dreamed… Across the vast Multiverse lies an empire founded in T'Challa's name. Readers caught a glimpse of it in MARVEL LEGACY #1. Now find out the truth behind the Intergalactic Empire of Wakanda! Ta-Nehisi Coates welcomes aboard fan-favorite artist Daniel Acuña for a Black Panther story unlike any other! 36 pages, full color. Rated T Cover price $4.99. Limited 1 for 50 Retailer Incentive Variant Cover. Written by Ta-Nehisi Coates. Art by Daniel Acuna. Cover by Olivier Coipel. A NEW DIRECTION FROM TA-NEHISI COATES & DANIEL ACUñA! A bold new direction for the Black Panther! For years, T'Challa has fought off invaders from his homeland, protecting Wakanda from everything from meddling governments to long-lost gods. Now, he will discover that Wakanda is much bigger than he ever dreamed… Across the vast Multiverse lies an empire founded in T'Challa's name. Readers caught a glimpse of it in MARVEL LEGACY #1. Now find out the truth behind the Intergalactic Empire of Wakanda! Ta-Nehisi Coates welcomes aboard fan-favorite artist Daniel Acuña for a Black Panther story unlike any other! 36 pages, full color. Rated T Cover price $4.99. Written by Ta-Nehisi Coates. Art by Daniel Acuna. Cover by Pepe Larraz. A NEW DIRECTION FROM TA-NEHISI COATES & DANIEL ACUñA! A bold new direction for the Black Panther! For years, T'Challa has fought off invaders from his homeland, protecting Wakanda from everything from meddling governments to long-lost gods. Now, he will discover that Wakanda is much bigger than he ever dreamed… Across the vast Multiverse lies an empire founded in T'Challa's name. Readers caught a glimpse of it in MARVEL LEGACY #1. Now find out the truth behind the Intergalactic Empire of Wakanda! Ta-Nehisi Coates welcomes aboard fan-favorite artist Daniel Acuña for a Black Panther story unlike any other! 36 pages, full color. Rated T Cover price $4.99. Blank Sketch Cover. Written by Ta-Nehisi Coates. Art by Daniel Acuna. A NEW DIRECTION FROM TA-NEHISI COATES & DANIEL ACUñA! A bold new direction for the Black Panther! For years, T'Challa has fought off invaders from his homeland, protecting Wakanda from everything from meddling governments to long-lost gods. Now, he will discover that Wakanda is much bigger than he ever dreamed… Across the vast Multiverse lies an empire founded in T'Challa's name. Readers caught a glimpse of it in MARVEL LEGACY #1. Now find out the truth behind the Intergalactic Empire of Wakanda! Ta-Nehisi Coates welcomes aboard fan-favorite artist Daniel Acuña for a Black Panther story unlike any other! 36 pages, full color. Rated T Cover price $4.99. Signed & Sketch By Leonard Kirk on 6/3/18. Sketch Edition. SKETCHED EDITION. Sketch area of the cover features a unique, original sketch rendered by various artists, obtained by fans. PLEASE NOTE: This is a generic picture of one copy only, every cover is unique, please see individual listings for exact cover details. Written by Ta-Nehisi Coates. Art by Daniel Acuna. A NEW DIRECTION FROM TA-NEHISI COATES & DANIEL ACUñA! A bold new direction for the Black Panther! For years, T'Challa has fought off invaders from his homeland, protecting Wakanda from everything from meddling governments to long-lost gods. Now, he will discover that Wakanda is much bigger than he ever dreamed… Across the vast Multiverse lies an empire founded in T'Challa's name. Readers caught a glimpse of it in MARVEL LEGACY #1. Now find out the truth behind the Intergalactic Empire of Wakanda! Ta-Nehisi Coates welcomes aboard fan-favorite artist Daniel Acuña for a Black Panther story unlike any other! 36 pages, full color. Rated T Cover price $4.99. Written by Ta-Nehisi Coates. Art by Daniel Acuna. Cover by Tom Beland. A NEW DIRECTION FROM TA-NEHISI COATES & DANIEL ACUñA! A bold new direction for the Black Panther! For years, T'Challa has fought off invaders from his homeland, protecting Wakanda from everything from meddling governments to long-lost gods. Now, he will discover that Wakanda is much bigger than he ever dreamed… Across the vast Multiverse lies an empire founded in T'Challa's name. Readers caught a glimpse of it in MARVEL LEGACY #1. Now find out the truth behind the Intergalactic Empire of Wakanda! Ta-Nehisi Coates welcomes aboard fan-favorite artist Daniel Acuña for a Black Panther story unlike any other! 36 pages, full color. Rated T Cover price $4.99. 2nd Printing. Written by Ta-Nehisi Coates. Art and Cover by Daniel Acuna. A NEW DIRECTION FROM TA-NEHISI COATES & DANIEL ACUñA! A bold new direction for the Black Panther! For years, T'Challa has fought off invaders from his homeland, protecting Wakanda from everything from meddling governments to long-lost gods. Now, he will discover that Wakanda is much bigger than he ever dreamed… Across the vast Multiverse lies an empire founded in T'Challa's name. Readers caught a glimpse of it in MARVEL LEGACY #1. Now find out the truth behind the Intergalactic Empire of Wakanda! Ta-Nehisi Coates welcomes aboard fan-favorite artist Daniel Acuña for a Black Panther story unlike any other! pages, full color. Rated T Cover price $4.99. Written by Daniel Kibblesmith. Art by Ricardo Lopez Ortiz. Cover by Ryan Benjamin. VIBRANIUM BULLETS AND REGROWING LIMBS - EVERYTHING YOU WANT FROM A COMIC IS HERE! Deadpool's teamed up with, taken down or taken a beating from just about every hero in the Marvel Universe. And no way is the Black Panther going to miss out on his turn. 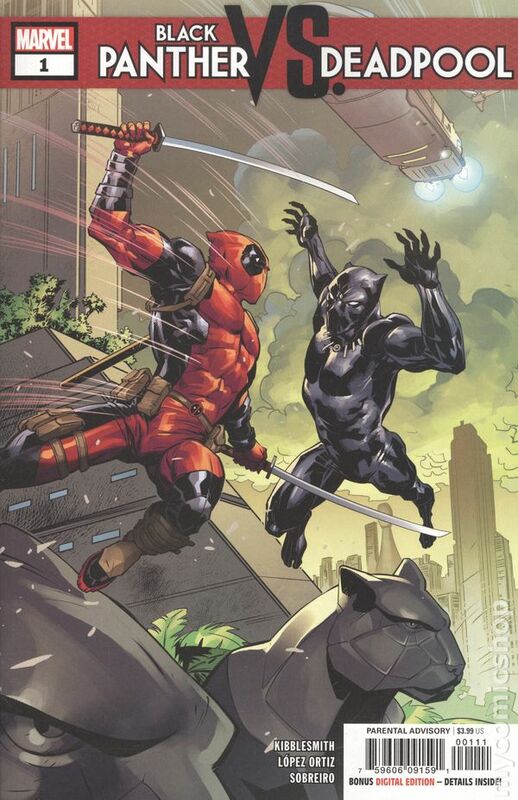 From Late Show writer Daniel Kibblesmith comes a hilarious romp through Wakanda as Deadpool goes on the hunt for the world's most valuable resource: Vibranium! When a beloved figure of the Marvel Universe becomes collateral damage in a fight between Deadpool and the Wrecker, the heroic Deadpool sets out to obtain a fragment of Vibranium that could save the victim's life. But his unconventional methods - ranging from poaching to dismemberment - don't sit well with the King of Wakanda, and Deadpool's about to learn that you don't bring a sword to a claw fight! Parental Advisory Cover price $3.99. Written by Daniel Kibblesmith. Art by Ricardo Lopez Ortiz. Cover by Cully Hamner. VIBRANIUM BULLETS AND REGROWING LIMBS - EVERYTHING YOU WANT FROM A COMIC IS HERE! Deadpool's teamed up with, taken down or taken a beating from just about every hero in the Marvel Universe. And no way is the Black Panther going to miss out on his turn. 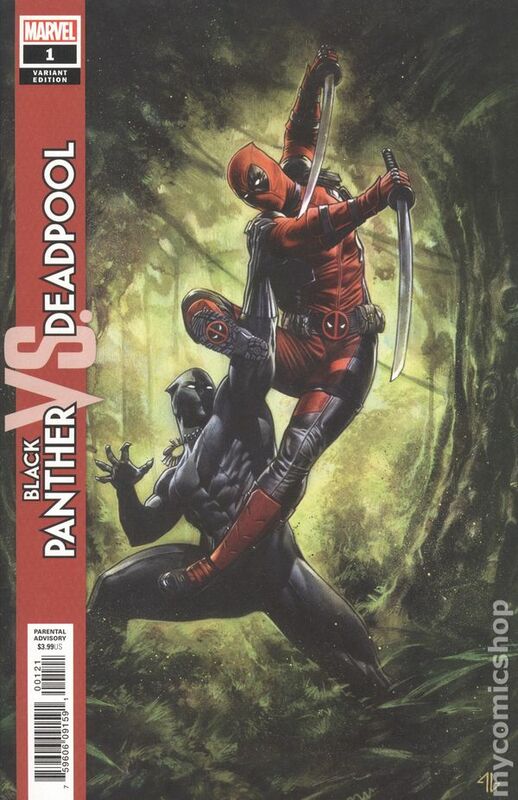 From Late Show writer Daniel Kibblesmith comes a hilarious romp through Wakanda as Deadpool goes on the hunt for the world's most valuable resource: Vibranium! When a beloved figure of the Marvel Universe becomes collateral damage in a fight between Deadpool and the Wrecker, the heroic Deadpool sets out to obtain a fragment of Vibranium that could save the victim's life. But his unconventional methods - ranging from poaching to dismemberment - don't sit well with the King of Wakanda, and Deadpool's about to learn that you don't bring a sword to a claw fight! 28 pages, full color. Parental Advisory Cover price $3.99. Limited 1 for 50 Retailer Incentive Variant Cover. Written by Daniel Kibblesmith. Art by Ricardo Lopez Ortiz. Cover by Adi Granov. VIBRANIUM BULLETS AND REGROWING LIMBS - EVERYTHING YOU WANT FROM A COMIC IS HERE! Deadpool's teamed up with, taken down or taken a beating from just about every hero in the Marvel Universe. And no way is the Black Panther going to miss out on his turn. From Late Show writer Daniel Kibblesmith comes a hilarious romp through Wakanda as Deadpool goes on the hunt for the world's most valuable resource: Vibranium! When a beloved figure of the Marvel Universe becomes collateral damage in a fight between Deadpool and the Wrecker, the heroic Deadpool sets out to obtain a fragment of Vibranium that could save the victim's life. 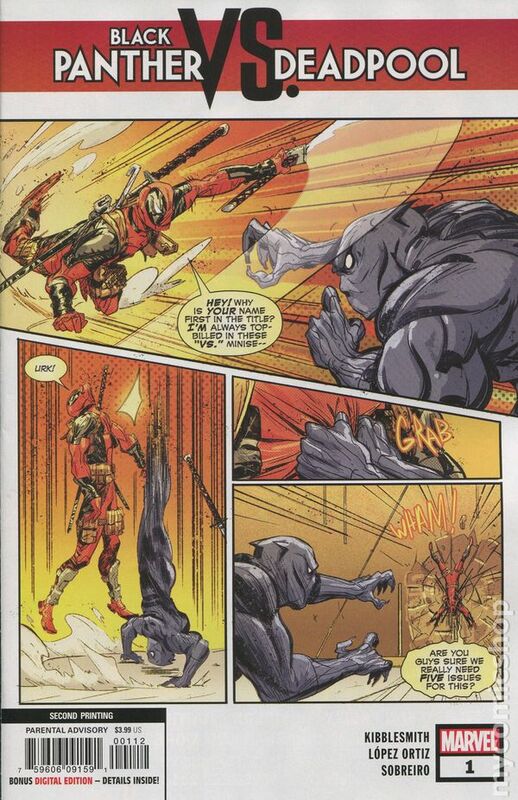 But his unconventional methods - ranging from poaching to dismemberment - don't sit well with the King of Wakanda, and Deadpool's about to learn that you don't bring a sword to a claw fight! 28 pages, full color. Parental Advisory Cover price $3.99. 2nd Printing. Written by Daniel Kibblesmith. Art and Cover by Ricardo Lopez Ortiz. VIBRANIUM BULLETS AND REGROWING LIMBS - EVERYTHING YOU WANT FROM A COMIC IS HERE! Deadpool's teamed up with, taken down or taken a beating from just about every hero in the Marvel Universe. And no way is the Black Panther going to miss out on his turn. 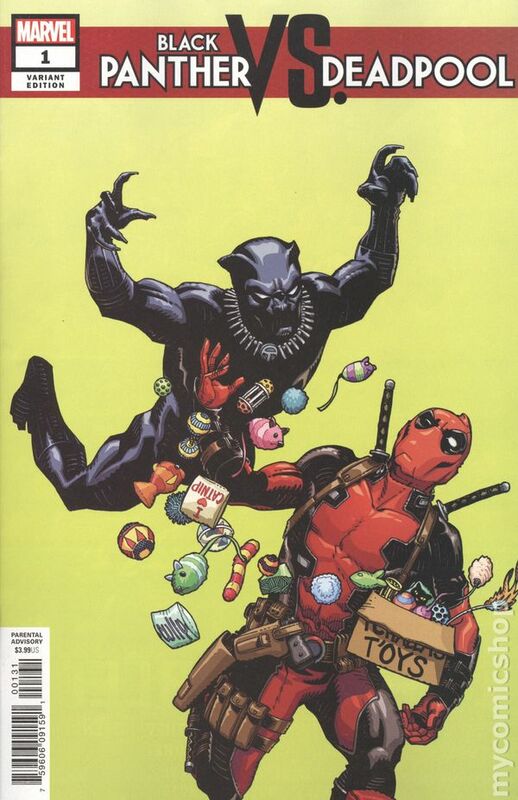 From Late Show writer Daniel Kibblesmith comes a hilarious romp through Wakanda as Deadpool goes on the hunt for the world's most valuable resource: Vibranium! When a beloved figure of the Marvel Universe becomes collateral damage in a fight between Deadpool and the Wrecker, the heroic Deadpool sets out to obtain a fragment of Vibranium that could save the victim's life. But his unconventional methods - ranging from poaching to dismemberment - don't sit well with the King of Wakanda, and Deadpool's about to learn that you don't bring a sword to a claw fight! 28 pages, full color. Parental Advisory Cover price $3.99. A Nation Under Our Feet: Part 1 of 11 - Written by Ta-Nehisi Coates. Art and Cover by Brian Stelfreeze. A new era for the Black Panther starts here! Written by MacArthur Genius and National Book Award winner TA-NEHISI COATES (Between the World and Me) and illustrated by living legend BRIAN STELFREEZE, 'A Nation Under Our Feet' is a story about dramatic upheaval in Wakanda and the Black Panther's struggle to do right by his people as their ruler. The indomitable will of Wakanda -- the famed African nation known for its vast wealth, advanced technology and warrior traditions -- has long been reflected in the will of its monarchs, the Black Panthers. But now the current Black Panther, T'Challa, finds that will tested by a superhuman terrorist group called The People that has sparked a violent uprising among the citizens of Wakanda. T'Challa knows the country must change to survive -- the question is, will the Black Panther survive the change? 36 pages, full color. Rated T+ Cover price $4.99. Limited 1 for 75 Retailer Incentive Variant Cover. Written by Ta-Nehisi Coates. Art by Brian Stelfreeze. Cover by Alex Ross. A new era for the Black Panther starts here! Written by MacArthur Genius and National Book Award winner TA-NEHISI COATES (Between the World and Me) and illustrated by living legend BRIAN STELFREEZE, 'A Nation Under Our Feet' is a story about dramatic upheaval in Wakanda and the Black Panther's struggle to do right by his people as their ruler. The indomitable will of Wakanda -- the famed African nation known for its vast wealth, advanced technology and warrior traditions -- has long been reflected in the will of its monarchs, the Black Panthers. But now the current Black Panther, T'Challa, finds that will tested by a superhuman terrorist group called The People that has sparked a violent uprising among the citizens of Wakanda. T'Challa knows the country must change to survive -- the question is, will the Black Panther survive the change? 36 pages, full color. Rated T+ Cover price $4.99. Bulletproof Comics Retailer Exclusive Cover. Written by Ta-Nehisi Coates. Art by Brian Stelfreeze. A new era for the Black Panther starts here! 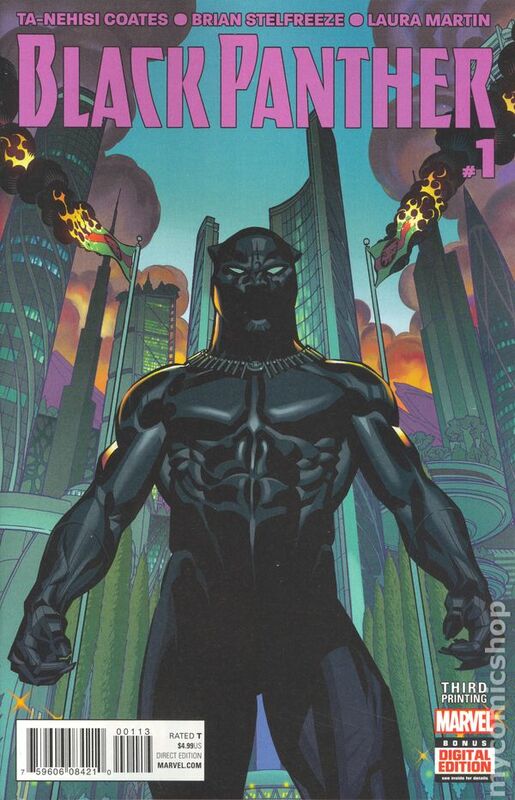 Written by MacArthur Genius and National Book Award winner TA-NEHISI COATES (Between the World and Me) and illustrated by living legend BRIAN STELFREEZE, 'A Nation Under Our Feet' is a story about dramatic upheaval in Wakanda and the Black Panther's struggle to do right by his people as their ruler. The indomitable will of Wakanda -- the famed African nation known for its vast wealth, advanced technology and warrior traditions -- has long been reflected in the will of its monarchs, the Black Panthers. But now the current Black Panther, T'Challa, finds that will tested by a superhuman terrorist group called The People that has sparked a violent uprising among the citizens of Wakanda. T'Challa knows the country must change to survive -- the question is, will the Black Panther survive the change? 36 pages, full color. Rated T+ Cover price $4.99. Limited 1 for 50 Retailer Incentive Variant Cover. Written by Ta-Nehisi Coates. 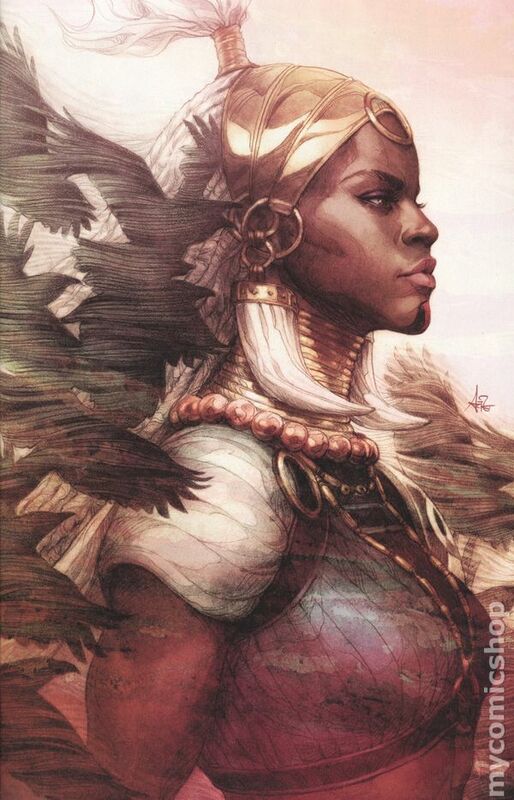 Art by Brian Stelfreeze. Cover by Olivier Coipel. A new era for the Black Panther starts here! Written by MacArthur Genius and National Book Award winner TA-NEHISI COATES (Between the World and Me) and illustrated by living legend BRIAN STELFREEZE, 'A Nation Under Our Feet' is a story about dramatic upheaval in Wakanda and the Black Panther's struggle to do right by his people as their ruler. The indomitable will of Wakanda -- the famed African nation known for its vast wealth, advanced technology and warrior traditions -- has long been reflected in the will of its monarchs, the Black Panthers. But now the current Black Panther, T'Challa, finds that will tested by a superhuman terrorist group called The People that has sparked a violent uprising among the citizens of Wakanda. T'Challa knows the country must change to survive -- the question is, will the Black Panther survive the change? 36 pages, full color. Rated T+ Cover price $4.99. 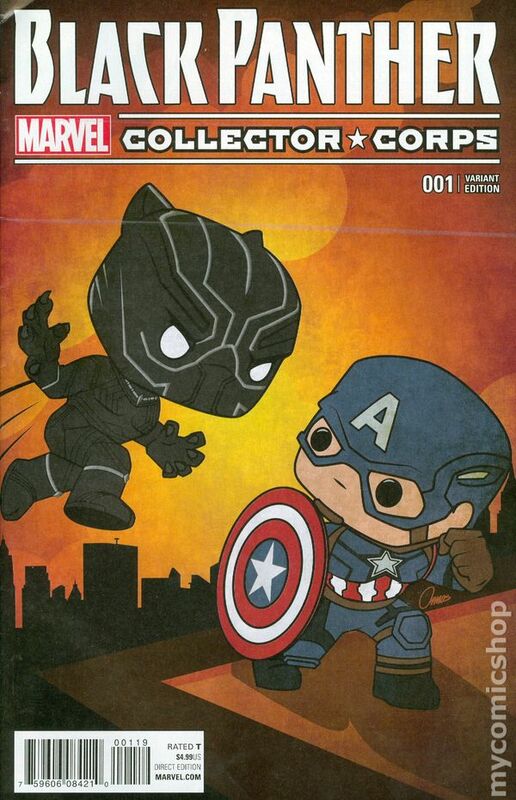 Collector Corps variant edition. A Nation Under Our Feet: Part 1 of 11 - Written by Ta-Nehisi Coates. Art by Brian Stelfreeze. Cover by Amos Maldonado. A new era for the Black Panther starts here! Written by MacArthur Genius and National Book Award winner TA-NEHISI COATES (Between the World and Me) and illustrated by living legend BRIAN STELFREEZE, 'A Nation Under Our Feet' is a story about dramatic upheaval in Wakanda and the Black Panther's struggle to do right by his people as their ruler. The indomitable will of Wakanda -- the famed African nation known for its vast wealth, advanced technology and warrior traditions -- has long been reflected in the will of its monarchs, the Black Panthers. But now the current Black Panther, T'Challa, finds that will tested by a superhuman terrorist group called The People that has sparked a violent uprising among the citizens of Wakanda. T'Challa knows the country must change to survive -- the question is, will the Black Panther survive the change? 36 pages, full color. Rated T+ Cover price $4.99. Written by Ta-Nehisi Coates. Art by Brian Stelfreeze. Cover by Sanford Greene. A new era for the Black Panther starts here! Written by MacArthur Genius and National Book Award winner TA-NEHISI COATES (Between the World and Me) and illustrated by living legend BRIAN STELFREEZE, 'A Nation Under Our Feet' is a story about dramatic upheaval in Wakanda and the Black Panther's struggle to do right by his people as their ruler. The indomitable will of Wakanda -- the famed African nation known for its vast wealth, advanced technology and warrior traditions -- has long been reflected in the will of its monarchs, the Black Panthers. But now the current Black Panther, T'Challa, finds that will tested by a superhuman terrorist group called The People that has sparked a violent uprising among the citizens of Wakanda. T'Challa knows the country must change to survive -- the question is, will the Black Panther survive the change? 36 pages, full color. Rated T+ Cover price $5.99. Limited 1 for 20 Retailer Incentive Variant Cover. Written by Ta-Nehisi Coates. Art and Cover by Brian Stelfreeze. A new era for the Black Panther starts here! Written by MacArthur Genius and National Book Award winner TA-NEHISI COATES (Between the World and Me) and illustrated by living legend BRIAN STELFREEZE, 'A Nation Under Our Feet' is a story about dramatic upheaval in Wakanda and the Black Panther's struggle to do right by his people as their ruler. The indomitable will of Wakanda -- the famed African nation known for its vast wealth, advanced technology and warrior traditions -- has long been reflected in the will of its monarchs, the Black Panthers. But now the current Black Panther, T'Challa, finds that will tested by a superhuman terrorist group called The People that has sparked a violent uprising among the citizens of Wakanda. T'Challa knows the country must change to survive -- the question is, will the Black Panther survive the change? 36 pages, full color. Rated T+ Cover price $4.99. Limited 1 for 25 Retailer Incentive Variant Cover. Written by Ta-Nehisi Coates. 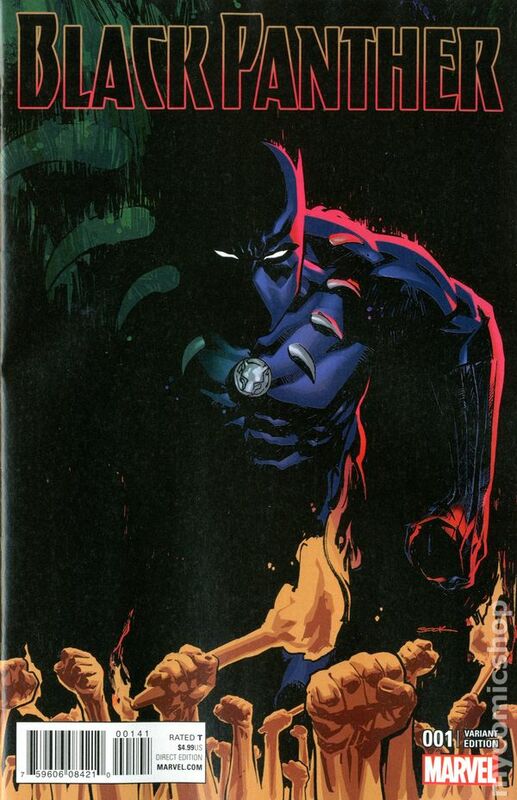 Art by Brian Stelfreeze. Cover by Felipe Smith. A new era for the Black Panther starts here! Written by MacArthur Genius and National Book Award winner TA-NEHISI COATES (Between the World and Me) and illustrated by living legend BRIAN STELFREEZE, 'A Nation Under Our Feet' is a story about dramatic upheaval in Wakanda and the Black Panther's struggle to do right by his people as their ruler. The indomitable will of Wakanda -- the famed African nation known for its vast wealth, advanced technology and warrior traditions -- has long been reflected in the will of its monarchs, the Black Panthers. But now the current Black Panther, T'Challa, finds that will tested by a superhuman terrorist group called The People that has sparked a violent uprising among the citizens of Wakanda. T'Challa knows the country must change to survive -- the question is, will the Black Panther survive the change? 36 pages, full color. Rated T+ Cover price $4.99. Limited 1 for 25 Retailer Incentive Variant Cover. Written by Ta-Nehisi Coates. Art by Brian Stelfreeze. Cover by Ryan Sook. A new era for the Black Panther starts here! Written by MacArthur Genius and National Book Award winner TA-NEHISI COATES (Between the World and Me) and illustrated by living legend BRIAN STELFREEZE, 'A Nation Under Our Feet' is a story about dramatic upheaval in Wakanda and the Black Panther's struggle to do right by his people as their ruler. The indomitable will of Wakanda -- the famed African nation known for its vast wealth, advanced technology and warrior traditions -- has long been reflected in the will of its monarchs, the Black Panthers. But now the current Black Panther, T'Challa, finds that will tested by a superhuman terrorist group called The People that has sparked a violent uprising among the citizens of Wakanda. T'Challa knows the country must change to survive -- the question is, will the Black Panther survive the change? 36 pages, full color. Rated T+ Cover price $4.99. Limited 1 for 10 Retailer Incentive Variant Cover. Written by Ta-Nehisi Coates. Art by Brian Stelfreeze. A new era for the Black Panther starts here! Written by MacArthur Genius and National Book Award winner TA-NEHISI COATES (Between the World and Me) and illustrated by living legend BRIAN STELFREEZE, 'A Nation Under Our Feet' is a story about dramatic upheaval in Wakanda and the Black Panther's struggle to do right by his people as their ruler. The indomitable will of Wakanda -- the famed African nation known for its vast wealth, advanced technology and warrior traditions -- has long been reflected in the will of its monarchs, the Black Panthers. But now the current Black Panther, T'Challa, finds that will tested by a superhuman terrorist group called The People that has sparked a violent uprising among the citizens of Wakanda. T'Challa knows the country must change to survive -- the question is, will the Black Panther survive the change? 36 pages, full color. Rated T+ Cover price $4.99. 2nd Printing. A Nation Under Our Feet: Part 1 - Written by Ta-Nehisi Coates. 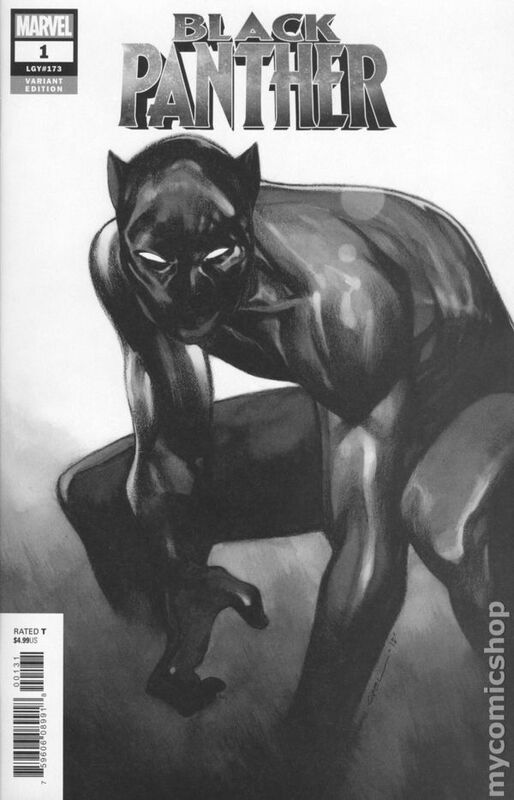 Art and Cover by Brian Stelfreeze. A new era for the Black Panther starts here! Written by MacArthur Genius and National Book Award winner TA-NEHISI COATES (Between the World and Me) and illustrated by living legend BRIAN STELFREEZE, 'A Nation Under Our Feet' is a story about dramatic upheaval in Wakanda and the Black Panther's struggle to do right by his people as their ruler. The indomitable will of Wakanda -- the famed African nation known for its vast wealth, advanced technology and warrior traditions -- has long been reflected in the will of its monarchs, the Black Panthers. But now the current Black Panther, T'Challa, finds that will tested by a superhuman terrorist group called The People that has sparked a violent uprising among the citizens of Wakanda. T'Challa knows the country must change to survive -- the question is, will the Black Panther survive the change? 36 pages, full color. Rated T+ Cover price $4.99. 3rd Printing. A Nation Under Our Feet: Part 1 - Written by Ta-Nehisi Coates. Art and Cover by Brian Stelfreeze. A new era for the Black Panther starts here! Written by MacArthur Genius and National Book Award winner TA-NEHISI COATES (Between the World and Me) and illustrated by living legend BRIAN STELFREEZE, 'A Nation Under Our Feet' is a story about dramatic upheaval in Wakanda and the Black Panther's struggle to do right by his people as their ruler. The indomitable will of Wakanda -- the famed African nation known for its vast wealth, advanced technology and warrior traditions -- has long been reflected in the will of its monarchs, the Black Panthers. But now the current Black Panther, T'Challa, finds that will tested by a superhuman terrorist group called The People that has sparked a violent uprising among the citizens of Wakanda. T'Challa knows the country must change to survive -- the question is, will the Black Panther survive the change? 36 pages, full color. Rated T+ Cover price $4.99. 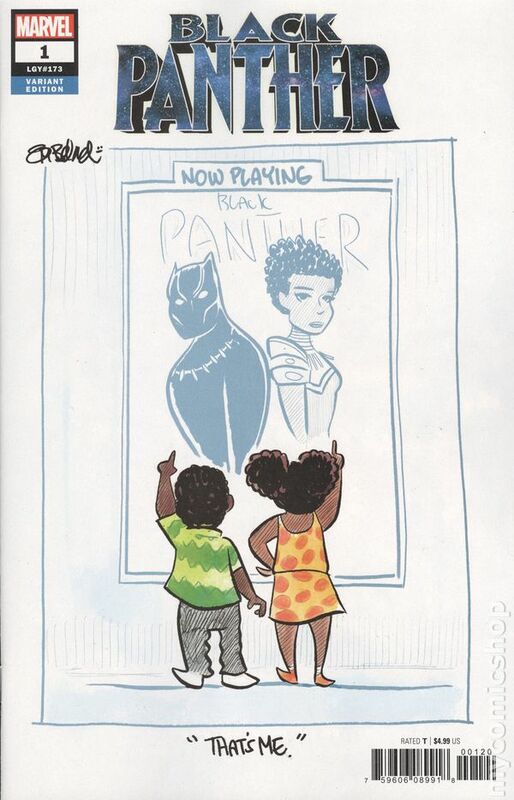 Baby Panther Variant by Skottie Young. Written by Ta-Nehisi Coates. Art by Brian Stelfreeze. Cover by Skottie Young. A new era for the Black Panther starts here! Written by MacArthur Genius and National Book Award winner TA-NEHISI COATES (Between the World and Me) and illustrated by living legend BRIAN STELFREEZE, 'A Nation Under Our Feet' is a story about dramatic upheaval in Wakanda and the Black Panther's struggle to do right by his people as their ruler. The indomitable will of Wakanda -- the famed African nation known for its vast wealth, advanced technology and warrior traditions -- has long been reflected in the will of its monarchs, the Black Panthers. But now the current Black Panther, T'Challa, finds that will tested by a superhuman terrorist group called The People that has sparked a violent uprising among the citizens of Wakanda. T'Challa knows the country must change to survive -- the question is, will the Black Panther survive the change? 36 pages, full color. Rated T+ Cover price $4.99. Hip Hop Variant Cover. Written by Ta-Nehisi Coates. Art and Cover by Brian Stelfreeze. A new era for the Black Panther starts here! Written by MacArthur Genius and National Book Award winner TA-NEHISI COATES (Between the World and Me) and illustrated by living legend BRIAN STELFREEZE, 'A Nation Under Our Feet' is a story about dramatic upheaval in Wakanda and the Black Panther's struggle to do right by his people as their ruler. The indomitable will of Wakanda -- the famed African nation known for its vast wealth, advanced technology and warrior traditions -- has long been reflected in the will of its monarchs, the Black Panthers. But now the current Black Panther, T'Challa, finds that will tested by a superhuman terrorist group called The People that has sparked a violent uprising among the citizens of Wakanda. T'Challa knows the country must change to survive -- the question is, will the Black Panther survive the change? 36 pages, full color. Rated T+ Cover price $4.99. Blank Variant Edition- A Nation Under Our Feet: Part 1 of 11 - Written by Ta-Nehisi Coates. 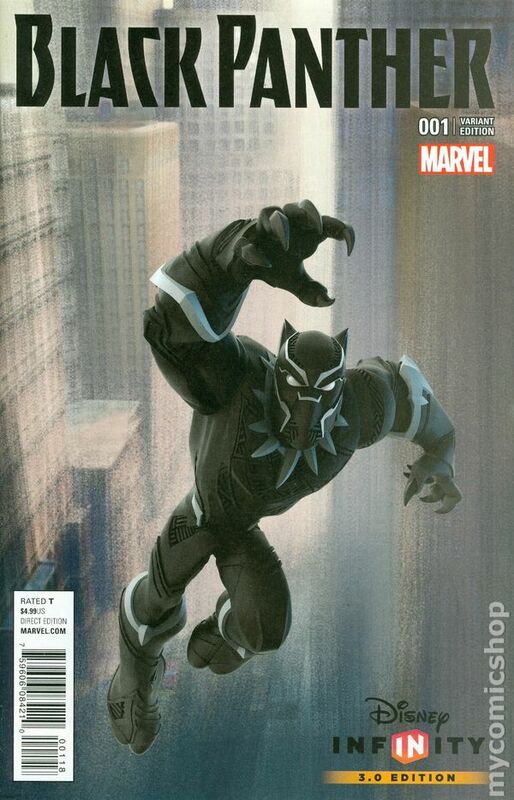 Art by Brian Stelfreeze, cover by Pasqual Ferry. A new era for the Black Panther starts here! Written by MacArthur Genius and National Book Award winner TA-NEHISI COATES (Between the World and Me) and illustrated by living legend BRIAN STELFREEZE, 'A Nation Under Our Feet' is a story about dramatic upheaval in Wakanda and the Black Panther's struggle to do right by his people as their ruler. 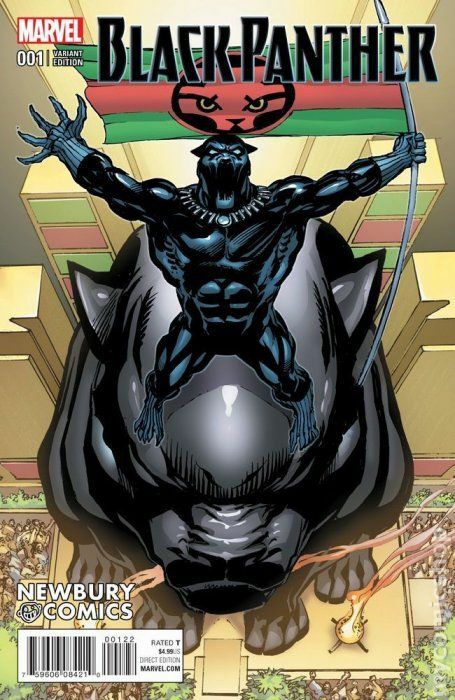 The indomitable will of Wakanda -- the famed African nation known for its vast wealth, advanced technology and warrior traditions -- has long been reflected in the will of its monarchs, the Black Panthers. But now the current Black Panther, T'Challa, finds that will tested by a superhuman terrorist group called The People that has sparked a violent uprising among the citizens of Wakanda. T'Challa knows the country must change to survive -- the question is, will the Black Panther survive the change? 36 pages, full color. Rated T+ Cover price $4.99. Midtown Comics Edition. A Nation Under Our Feet: Part 1 of 11 - Written by Ta-Nehisi Coates. Art and Cover by Brian Stelfreeze. A new era for the Black Panther starts here! Written by MacArthur Genius and National Book Award winner TA-NEHISI COATES (Between the World and Me) and illustrated by living legend BRIAN STELFREEZE, 'A Nation Under Our Feet' is a story about dramatic upheaval in Wakanda and the Black Panther's struggle to do right by his people as their ruler. The indomitable will of Wakanda -- the famed African nation known for its vast wealth, advanced technology and warrior traditions -- has long been reflected in the will of its monarchs, the Black Panthers. But now the current Black Panther, T'Challa, finds that will tested by a superhuman terrorist group called The People that has sparked a violent uprising among the citizens of Wakanda. T'Challa knows the country must change to survive -- the question is, will the Black Panther survive the change? 36 pages, full color. Rated T+ Cover price $4.99. 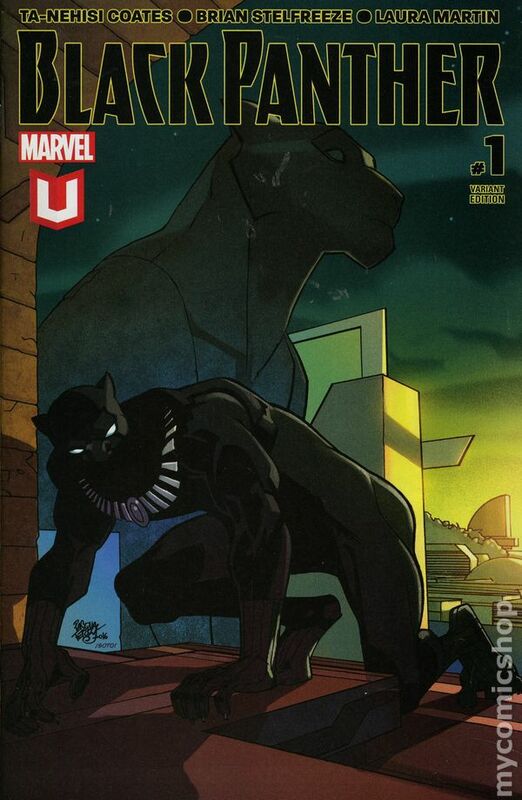 Marvel Unlimited Subscription Variant- A Nation Under Our Feet: Part 1 of 11 - Written by Ta-Nehisi Coates. 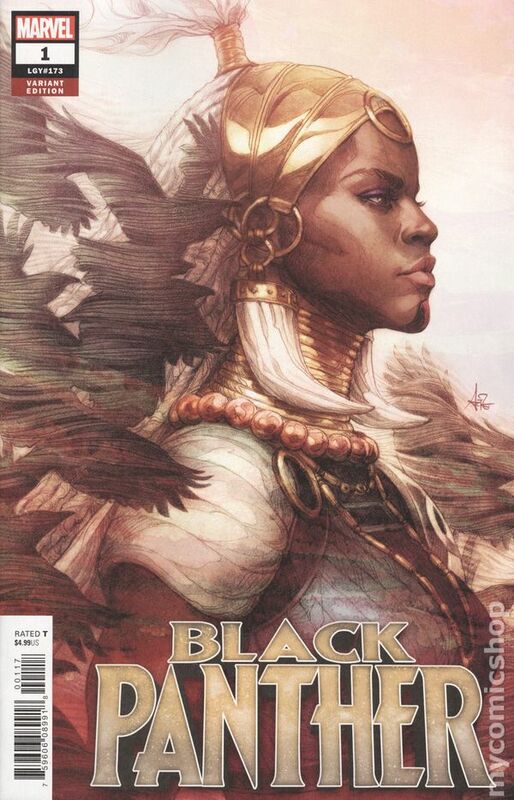 Art by Brian Stelfreeze, cover by Pasqual Ferry. A new era for the Black Panther starts here! Written by MacArthur Genius and National Book Award winner TA-NEHISI COATES (Between the World and Me) and illustrated by living legend BRIAN STELFREEZE, 'A Nation Under Our Feet' is a story about dramatic upheaval in Wakanda and the Black Panther's struggle to do right by his people as their ruler. The indomitable will of Wakanda -- the famed African nation known for its vast wealth, advanced technology and warrior traditions -- has long been reflected in the will of its monarchs, the Black Panthers. But now the current Black Panther, T'Challa, finds that will tested by a superhuman terrorist group called The People that has sparked a violent uprising among the citizens of Wakanda. T'Challa knows the country must change to survive -- the question is, will the Black Panther survive the change? 36 pages, full color. Rated T+ Cover price $4.99. Negative Space Exclusive Variant cover by John Tyler Christopher. A Nation Under Our Feet: Part 1 of 11 - Written by Ta-Nehisi Coates. 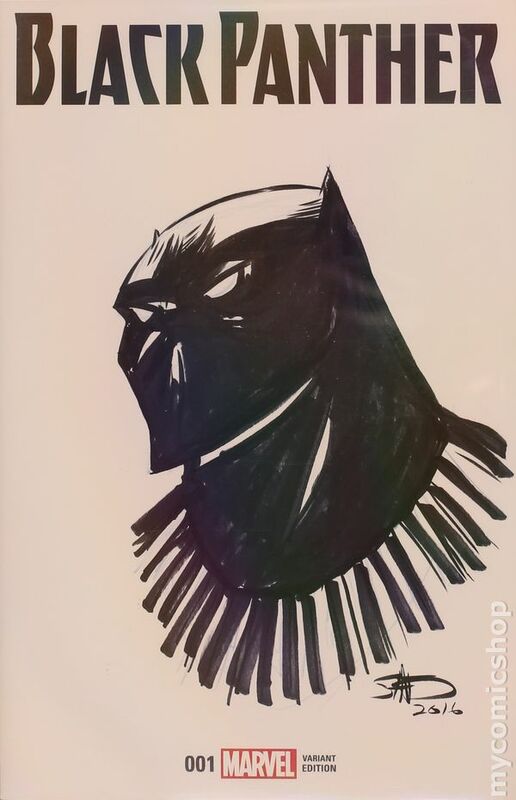 Art by Brian Stelfreeze. A new era for the Black Panther starts here! Written by MacArthur Genius and National Book Award winner TA-NEHISI COATES (Between the World and Me) and illustrated by living legend BRIAN STELFREEZE, 'A Nation Under Our Feet' is a story about dramatic upheaval in Wakanda and the Black Panther's struggle to do right by his people as their ruler. The indomitable will of Wakanda -- the famed African nation known for its vast wealth, advanced technology and warrior traditions -- has long been reflected in the will of its monarchs, the Black Panthers. But now the current Black Panther, T'Challa, finds that will tested by a superhuman terrorist group called The People that has sparked a violent uprising among the citizens of Wakanda. 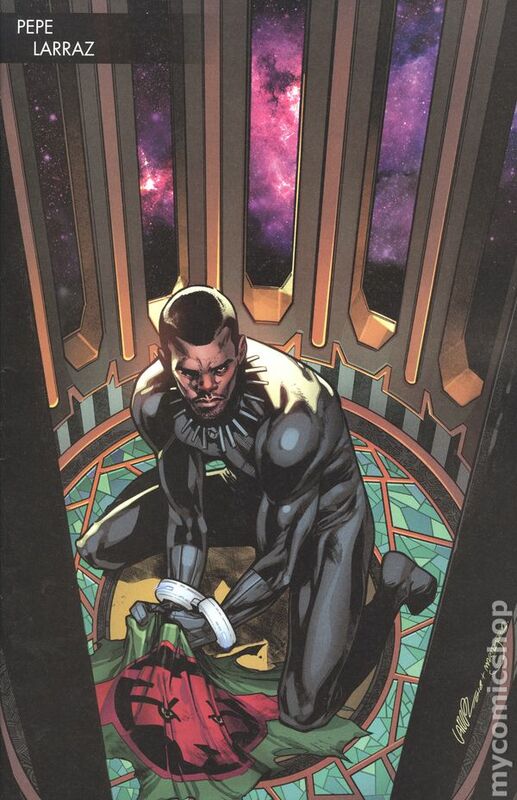 T'Challa knows the country must change to survive -- the question is, will the Black Panther survive the change? 36 pages, full color. Rated T+ Cover price $4.99. This is a consignment item. A 3% buyer's premium ($1.62) will be charged at checkout. Newbury Comics Exclusive Variant cover by Neal Adams. A Nation Under Our Feet: Part 1 of 11 - Written by Ta-Nehisi Coates. Art by Brian Stelfreeze. A new era for the Black Panther starts here! 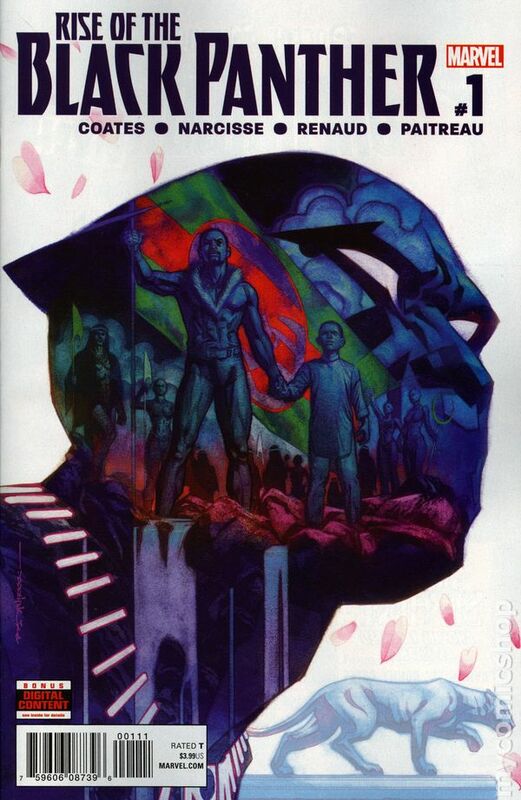 Written by MacArthur Genius and National Book Award winner TA-NEHISI COATES (Between the World and Me) and illustrated by living legend BRIAN STELFREEZE, 'A Nation Under Our Feet' is a story about dramatic upheaval in Wakanda and the Black Panther's struggle to do right by his people as their ruler. The indomitable will of Wakanda -- the famed African nation known for its vast wealth, advanced technology and warrior traditions -- has long been reflected in the will of its monarchs, the Black Panthers. But now the current Black Panther, T'Challa, finds that will tested by a superhuman terrorist group called The People that has sparked a violent uprising among the citizens of Wakanda. T'Challa knows the country must change to survive -- the question is, will the Black Panther survive the change? 36 pages, full color. Rated T+ Cover price $4.99. 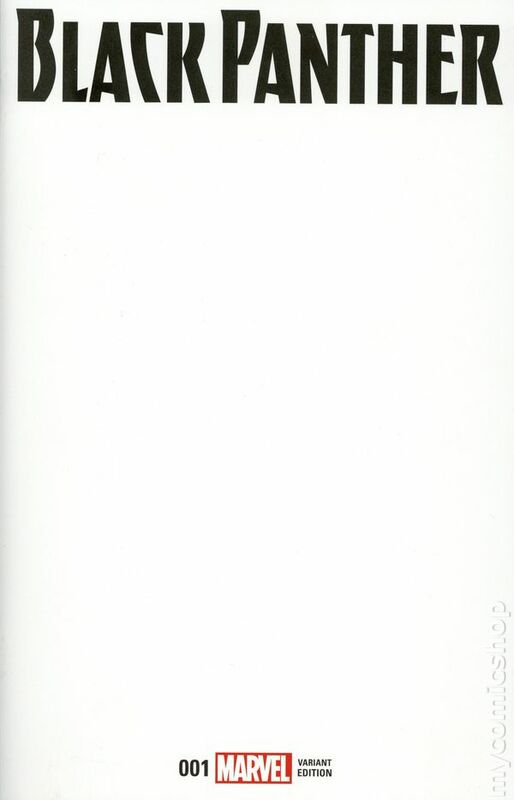 This is the blank cover edition with a unique, hand-drawn sketch rendered on the cover. PLEASE NOTE: This is a generic picture of one copy only, every cover is unique, please see individual listings for exact cover details. GRADING NOTE: Book handled by artist while creating sketch. Grade does not reflect any of the collateral staining, smudging that results from this process. Written by Ta-Nehisi Coates. 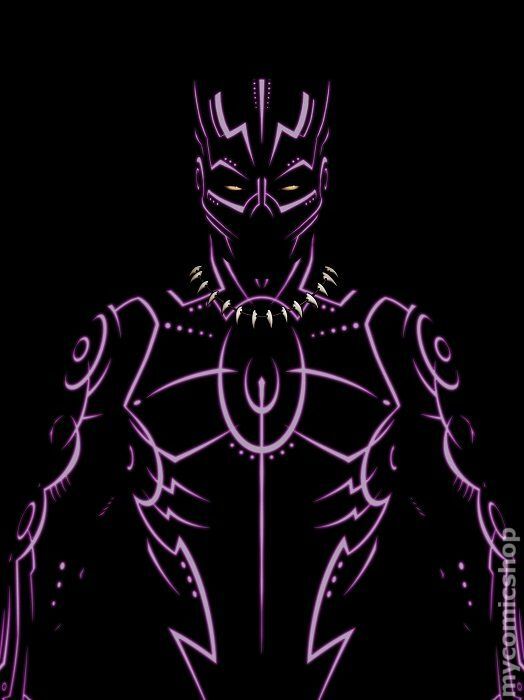 Art by Brian Stelfreeze. A new era for the Black Panther starts here! Written by MacArthur Genius and National Book Award winner TA-NEHISI COATES (Between the World and Me) and illustrated by living legend BRIAN STELFREEZE, 'A Nation Under Our Feet' is a story about dramatic upheaval in Wakanda and the Black Panther's struggle to do right by his people as their ruler. The indomitable will of Wakanda -- the famed African nation known for its vast wealth, advanced technology and warrior traditions -- has long been reflected in the will of its monarchs, the Black Panthers. But now the current Black Panther, T'Challa, finds that will tested by a superhuman terrorist group called The People that has sparked a violent uprising among the citizens of Wakanda. 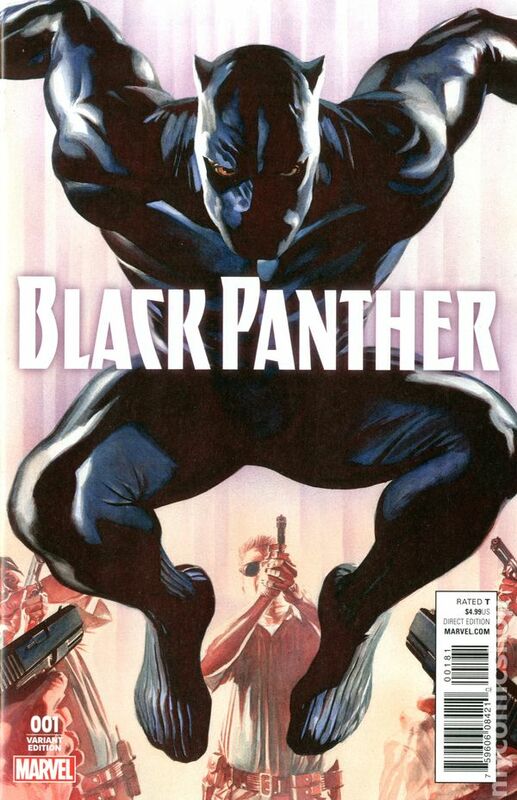 T'Challa knows the country must change to survive -- the question is, will the Black Panther survive the change? 36 pages, full color. Rated T+ Cover price $4.99. 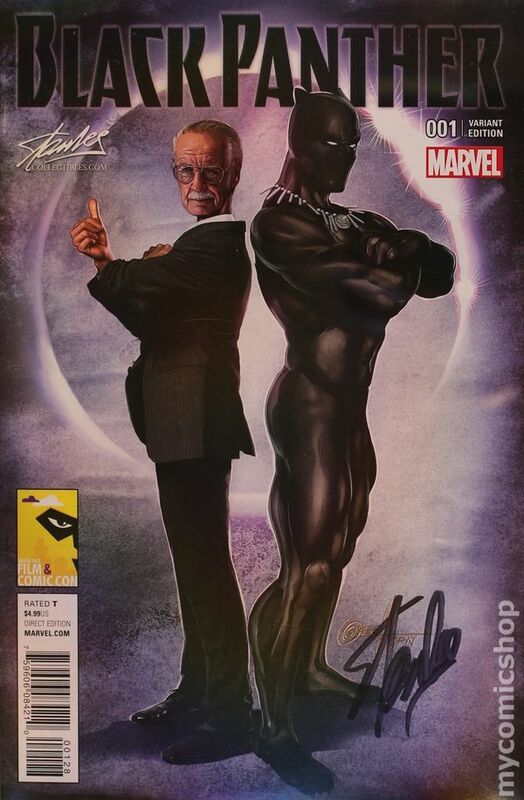 Stan Lee Collectibles MEFCC Edition Cover by Greg Horn. A Nation Under Our Feet: Part 1 of 11 - Written by Ta-Nehisi Coates. 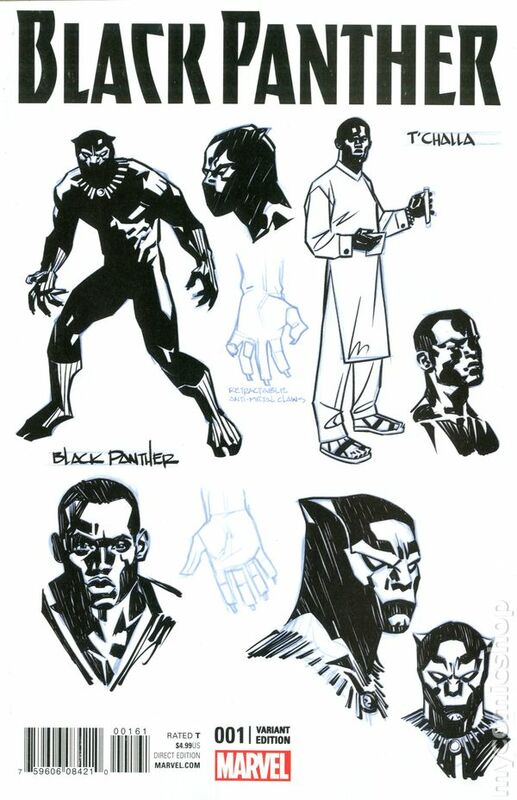 Art by Brian Stelfreeze. A new era for the Black Panther starts here! Written by MacArthur Genius and National Book Award winner TA-NEHISI COATES (Between the World and Me) and illustrated by living legend BRIAN STELFREEZE, 'A Nation Under Our Feet' is a story about dramatic upheaval in Wakanda and the Black Panther's struggle to do right by his people as their ruler. The indomitable will of Wakanda -- the famed African nation known for its vast wealth, advanced technology and warrior traditions -- has long been reflected in the will of its monarchs, the Black Panthers. But now the current Black Panther, T'Challa, finds that will tested by a superhuman terrorist group called The People that has sparked a violent uprising among the citizens of Wakanda. 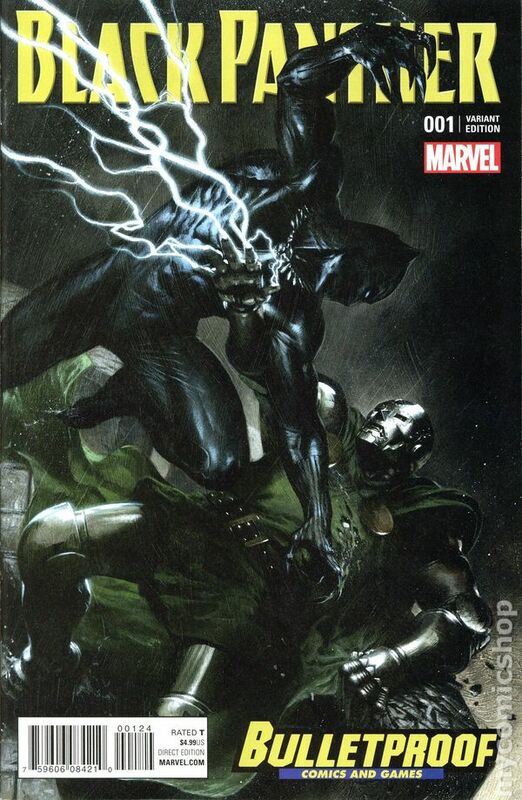 T'Challa knows the country must change to survive -- the question is, will the Black Panther survive the change? 36 pages, full color. Rated T+ Cover price $4.99. Published Apr 2005 by Marvel. guy in black suit standing in field - barcode MUST ends in "00111" Written by REGINALD HUDLIN Pencils & Cover by JOHN ROMITA JR. The Wakandan super hero is back with Hollywood heavyweight Hudlin (HOUSE PARTY, BOOMERANG) and fan favorite Romita Jr. (WOLVERINE, AMAZING SPIDER-MAN), teaming up to deliver a new ongoing series that's sure to excite true believers and the hip hop faithful. The Black Panther's origin is retold in a cinematic scope with social satire and all-out action. Marvel has big plans for the Panther. He's destined to become a key player in the Marvel Universe this year, so reader, get on board now! 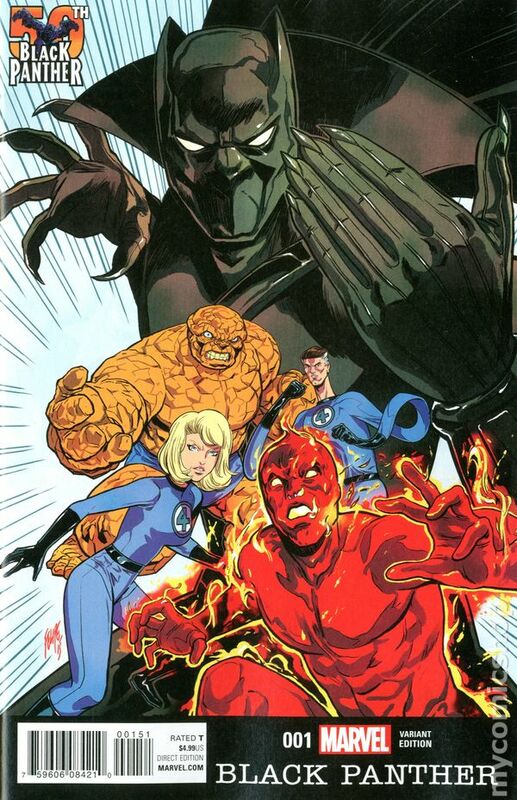 32 PGS./Marvel PSR ...$2.99 Cover price $2.99. Dynamic Forces Signed Edition. 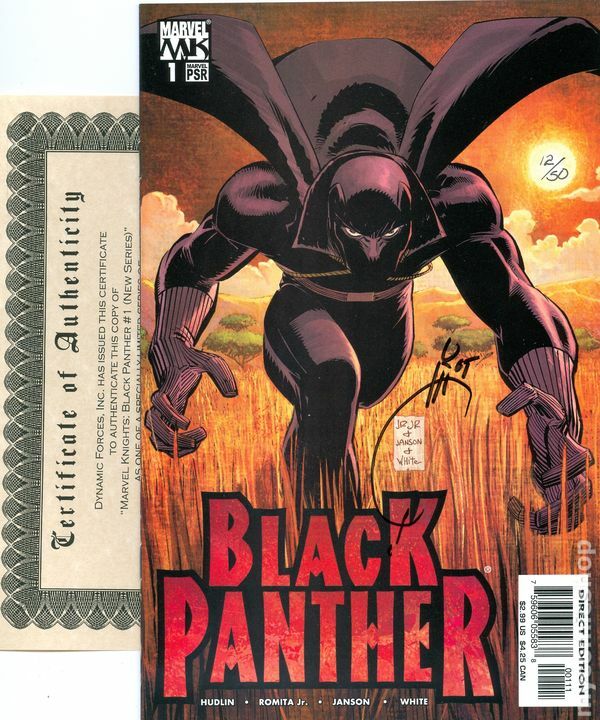 Signed by Joe Quesada. Limited to 50 copies. Includes numbered Dynamic Forces Certificate of Authenticity. Written by REGINALD HUDLIN Pencils & Cover by JOHN ROMITA JR. The Wakandan super hero is back with Hollywood heavyweight Hudlin (HOUSE PARTY, BOOMERANG) and fan favorite Romita Jr. (WOLVERINE, AMAZING SPIDER-MAN), teaming up to deliver a new ongoing series that's sure to excite true believers and the hip hop faithful. The Black Panther's origin is retold in a cinematic scope with social satire and all-out action. 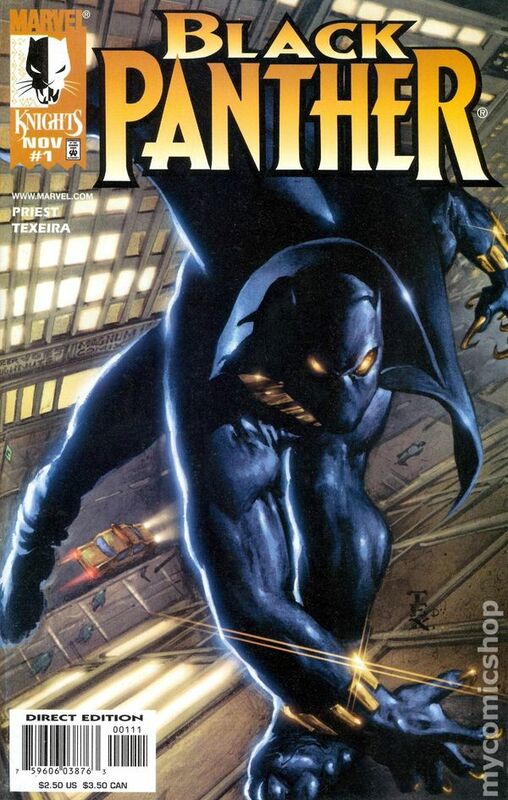 Marvel has big plans for the Panther. He's destined to become a key player in the Marvel Universe this year, so reader, get on board now! 32 PGS./Marvel NOTE: The scan is for reference purposes only and does not reflect the actual edition number that will be received. 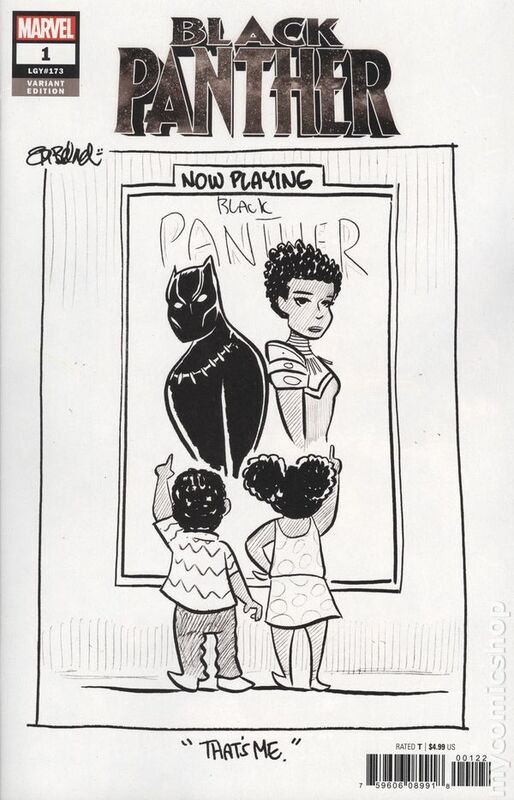 Written by REGINALD HUDLIN. Pencils by JOHN ROMITA JR. Cover by ESAD RIBIC. The Wakandan super hero is back with Hollywood heavyweight Hudlin (HOUSE PARTY, BOOMERANG) and fan favorite Romita Jr. (WOLVERINE, AMAZING SPIDER-MAN), teaming up to deliver a new ongoing series that's sure to excite true believers and the hip hop faithful. The Black Panther's origin is retold in a cinematic scope with social satire and all-out action. Marvel has big plans for the Panther. He's destined to become a key player in the Marvel Universe this year, so reader, get on board now! 32 PGS. Guy in black fighting guy in red,white and blue barcode ends in 00121. Cover price $2.99. guy in black with sunset in background; Must say "Limited Edition" Written by REGINALD HUDLIN Pencils & Cover by JOHN ROMITA JR. The Wakandan super hero is back with Hollywood heavyweight Hudlin (HOUSE PARTY, BOOMERANG) and fan favorite Romita Jr. (WOLVERINE, AMAZING SPIDER-MAN), teaming up to deliver a new ongoing series that's sure to excite true believers and the hip hop faithful. The Black Panther's origin is retold in a cinematic scope with social satire and all-out action. 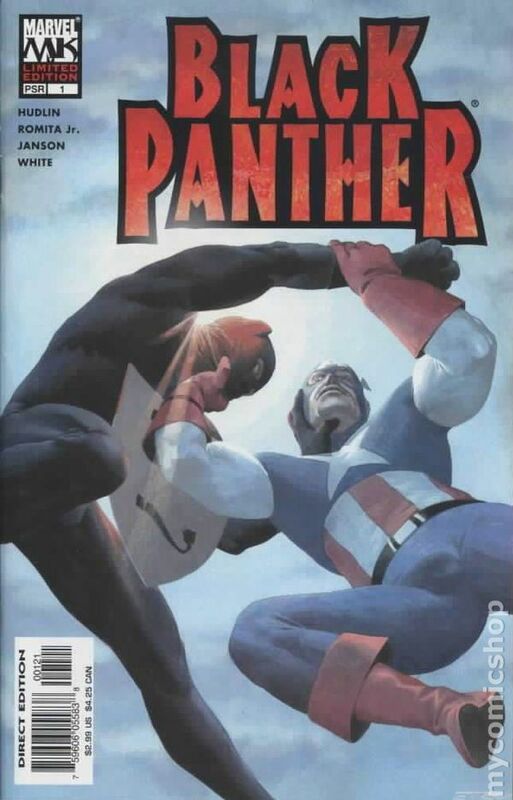 Marvel has big plans for the Panther. He's destined to become a key player in the Marvel Universe this year, so reader, get on board now! 32 PGS./Marvel PSR ...$2.99 Cover price $2.99. Published Jan 1977 by Marvel. This is a consignment item. A 3% buyer's premium ($34.47) will be charged at checkout. This is a consignment item. A 3% buyer's premium ($90.00) will be charged at checkout. This is a consignment item. A 3% buyer's premium ($14.67) will be charged at checkout. Signed by Stan Lee on 02/25/2015. This is a consignment item. A 3% buyer's premium ($6.60) will be charged at checkout. This is a consignment item. A 3% buyer's premium ($7.08) will be charged at checkout. This is a consignment item. A 3% buyer's premium ($7.49) will be charged at checkout. This is a consignment item. A 3% buyer's premium ($3.42) will be charged at checkout. This is a consignment item. A 3% buyer's premium ($4.70) will be charged at checkout. This is a consignment item. A 3% buyer's premium ($3.57) will be charged at checkout. It has been graded by MyComicShop's experienced graders. This is a consignment item. A 3% buyer's premium ($2.42) will be charged at checkout. This is a consignment item. A 3% buyer's premium ($1.98) will be charged at checkout. It has been graded by MyComicShop's experienced graders. This is a consignment item. A 3% buyer's premium ($2.65) will be charged at checkout. It has been graded by MyComicShop's experienced graders. This is a consignment item. A 3% buyer's premium ($1.74) will be charged at checkout. It has been graded by MyComicShop's experienced graders. This is a consignment item. A 3% buyer's premium ($3.18) will be charged at checkout. It has been graded by MyComicShop's experienced graders. This is a consignment item. A 3% buyer's premium ($2.36) will be charged at checkout. It has been graded by MyComicShop's experienced graders. This is a consignment item. A 3% buyer's premium ($2.91) will be charged at checkout. It has been graded by MyComicShop's experienced graders. Cover pencils by Jack Kirby, inks by John Verpoorten. 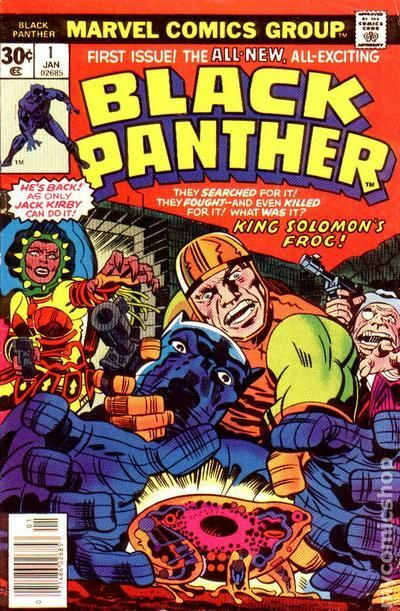 King Solomon's Frog!, script and pencils by Jack Kirby, inks by Mike Royer; Black Panther helps Abner Little, a member of the Collectors, recover the Brass Frog, an ancient time machine; Due to its dangerous nature, the Frog had previously been hidden away by the Black Panther's grandfather, Azzuri, but was taken by Alfred Queely, a fellow member of the Collectors; After getting the Frog, the Black Panther and Little are attacked by Princess Zanda, another member of the Collectors, for control of the artifact. During the battle, the Frog is activated and a mysterious creature, Hatch-22, appears. 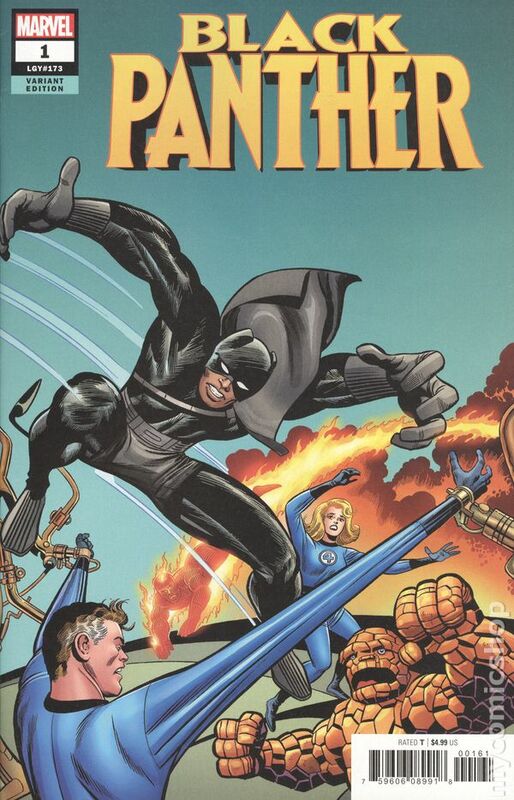 Jack Kirby writes about what readers can expect from his new Black Panther. 36 pgs. $0.30. Cover price $0.30. Cover art by Mark Texeira. 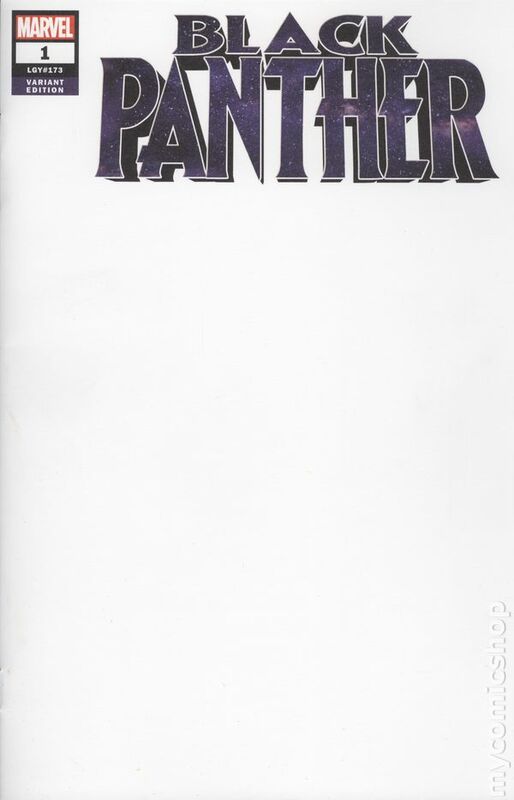 Background page providing information on the Black Panther. 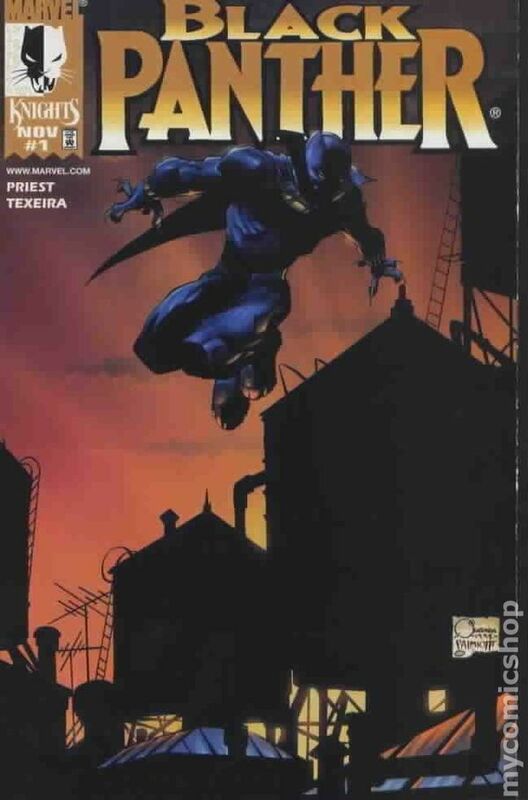 The Client, script by Christopher Priest, pencils by Joe Quesada (storytelling) and Mark Texeira, inks by Mark Texeira and Alitha Martinez (background assists); Leaving behind unrest among refugees in Wakanda, the Black Panther comes to New York to investigate scandal in the Tomorrow Fund. 38 pgs. $2.50. Cover price $2.50. Dynamic Forces Exclusive Variant Cover. HAS DF Certificate of Authenticity. One of Eight thousand Cover price $6.95. Dynamic Forces Exclusive Signed Variant Cover. Signed by Mark Texiera. Limited to 1000 copies. Includes numbered Dynamic Forces Certificate of Authenticity. NOTE: Scan is for reference purposes only and does not reflect the actual edition number that may be received. Written by Ta-Nehisi Coates and Evan Narcisse. Art by Paul Renaud. 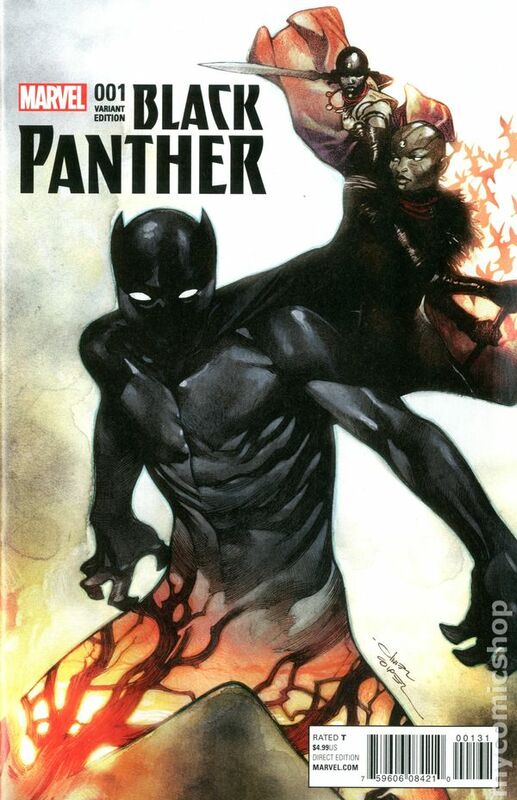 Cover by Brian Stelfreeze. 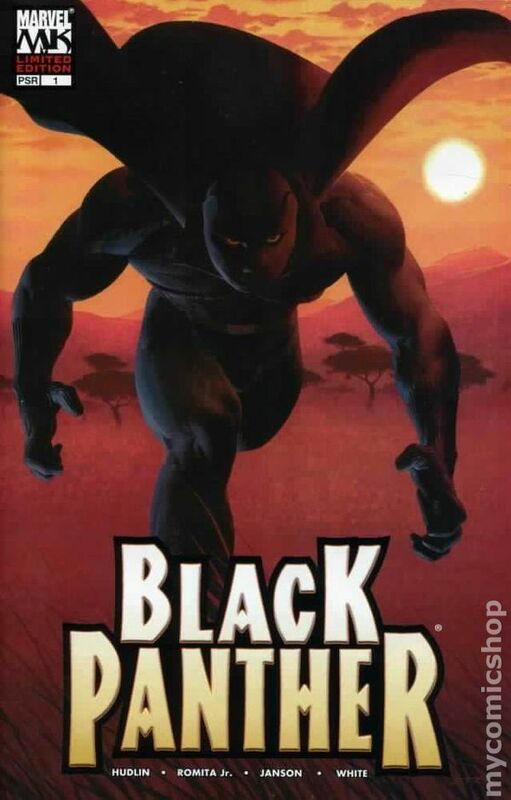 SECRET ORIGIN OF THE BLACK PANTHER Part 1 Just in time for the highly anticipated film, witness the early years of the man who will come to rule one of the most scientifically advanced countries in the world! Wakanda has always kept itself isolated from Western society, but that's all about to change. 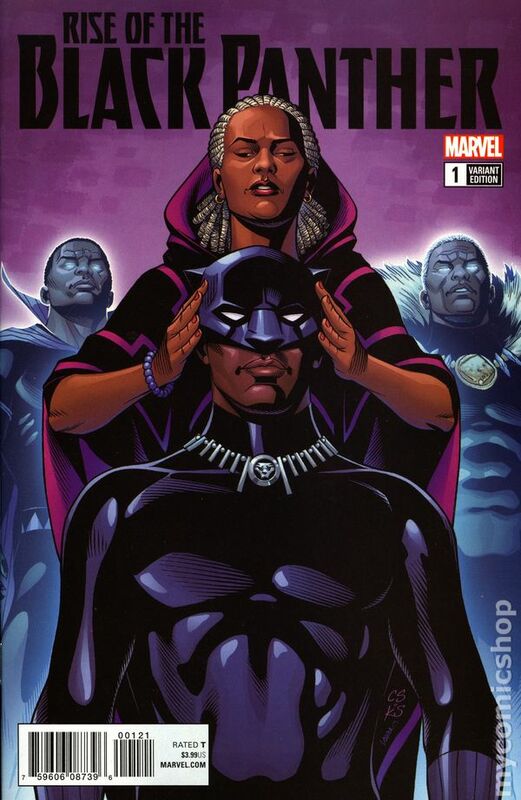 Young T'Challa knows he is destined to become king, but when his father is brutally murdered by outsiders, he'll find himself taking up a mantle he may not be ready for. Experience never-before-seen drama from the reign of T'Chaka, the king whose death changes a nation's history forever. Learn about the mother T'Challa never knew. See how the world learns about this wondrous nation for the first time. Will the power of the Black Panther be enough to keep his country safe? 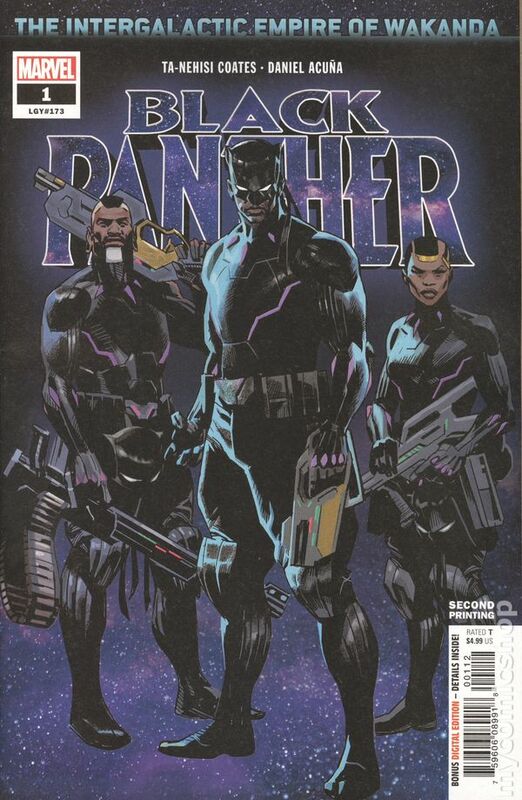 Journalist Evan Narcisse makes his comics debut alongside acclaimed writer Ta-Nehisi Coates as they chronicle T'Challa's rise to the throne - and to the Panther legacy that made him an Avenger. 28 pages, full color. Rated T Cover price $3.99. Limited 1 for 50 Retailer Incentive Variant Cover. Written by Ta-Nehisi Coates and Evan Narcisse. Art and Cover by Paul Renaud. 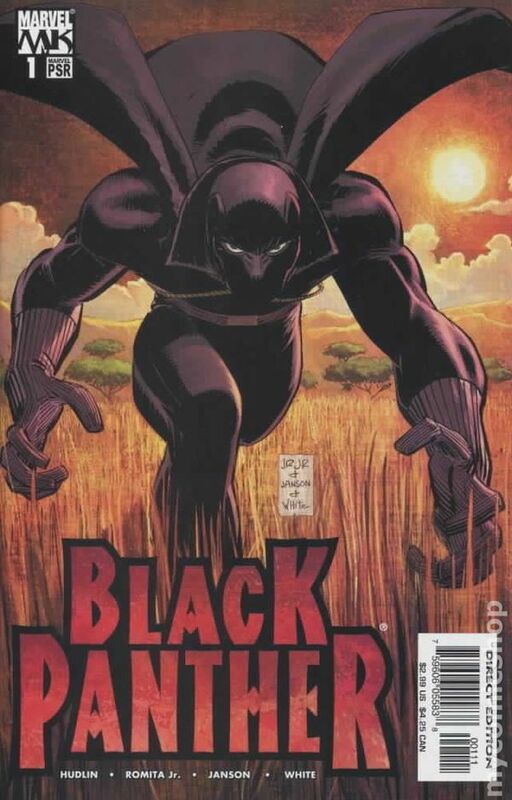 SECRET ORIGIN OF THE BLACK PANTHER Part 1 Just in time for the highly anticipated film, witness the early years of the man who will come to rule one of the most scientifically advanced countries in the world! Wakanda has always kept itself isolated from Western society, but that's all about to change. 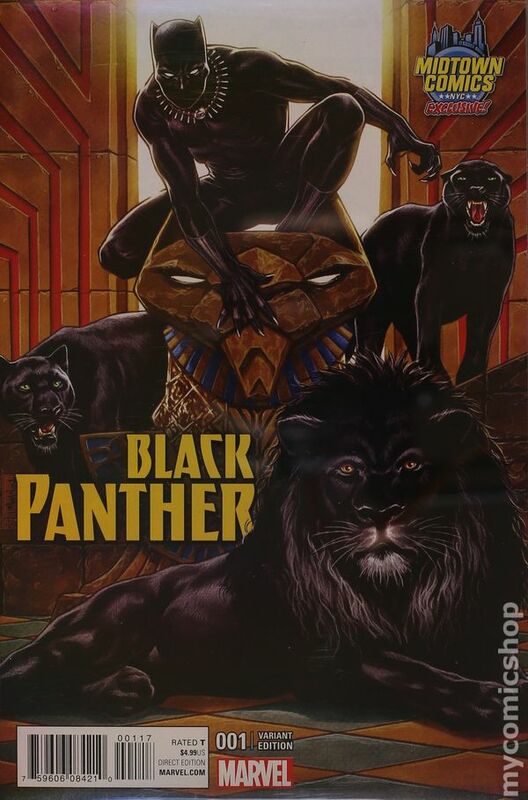 Young T'Challa knows he is destined to become king, but when his father is brutally murdered by outsiders, he'll find himself taking up a mantle he may not be ready for. Experience never-before-seen drama from the reign of T'Chaka, the king whose death changes a nation's history forever. Learn about the mother T'Challa never knew. See how the world learns about this wondrous nation for the first time. Will the power of the Black Panther be enough to keep his country safe? 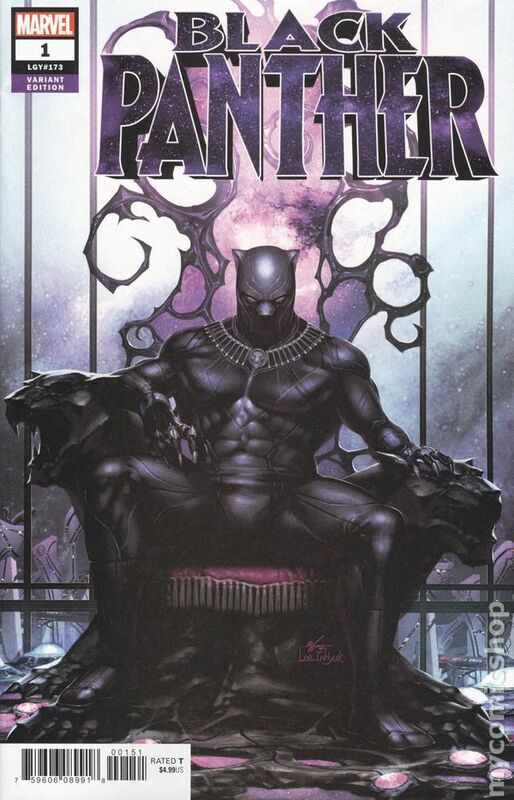 Journalist Evan Narcisse makes his comics debut alongside acclaimed writer Ta-Nehisi Coates as they chronicle T'Challa's rise to the throne - and to the Panther legacy that made him an Avenger. 28 pages, full color. Rated T Cover price $3.99. Limited 1 for 25 Retailer Incentive Variant Cover. Written by Ta-Nehisi Coates and Evan Narcisse. Art by Paul Renaud. Cover by Chris Sprouse. 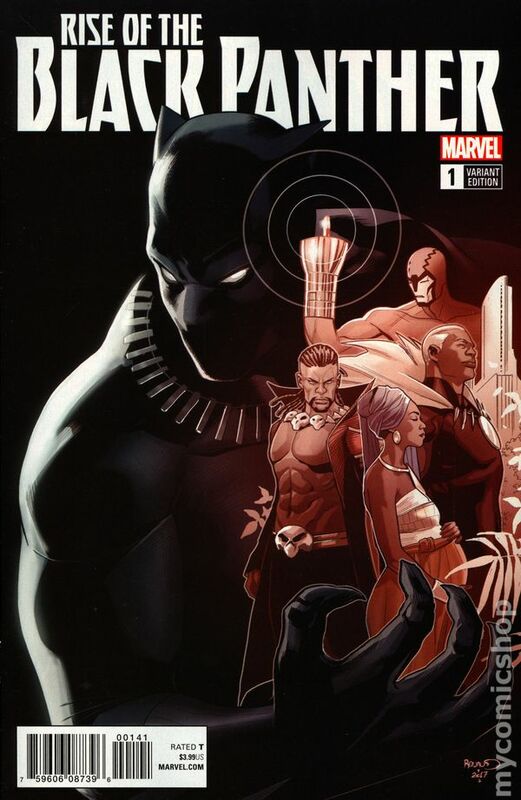 SECRET ORIGIN OF THE BLACK PANTHER Part 1 Just in time for the highly anticipated film, witness the early years of the man who will come to rule one of the most scientifically advanced countries in the world! Wakanda has always kept itself isolated from Western society, but that's all about to change. 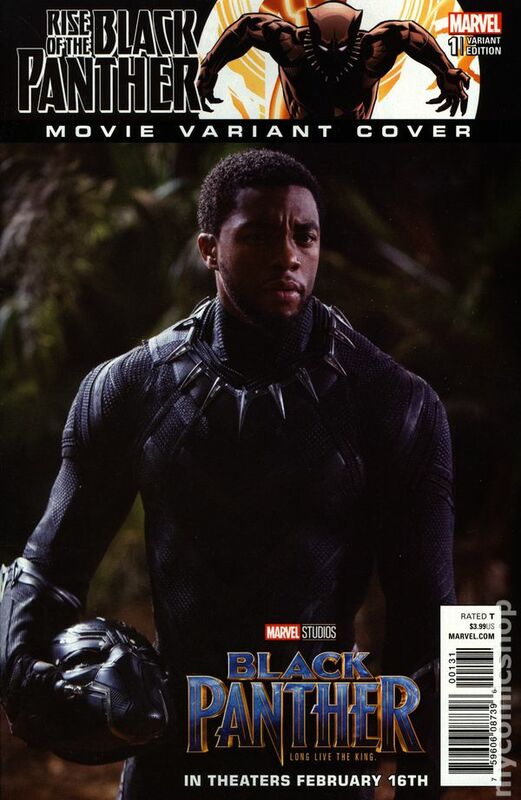 Young T'Challa knows he is destined to become king, but when his father is brutally murdered by outsiders, he'll find himself taking up a mantle he may not be ready for. Experience never-before-seen drama from the reign of T'Chaka, the king whose death changes a nation's history forever. Learn about the mother T'Challa never knew. See how the world learns about this wondrous nation for the first time. Will the power of the Black Panther be enough to keep his country safe? 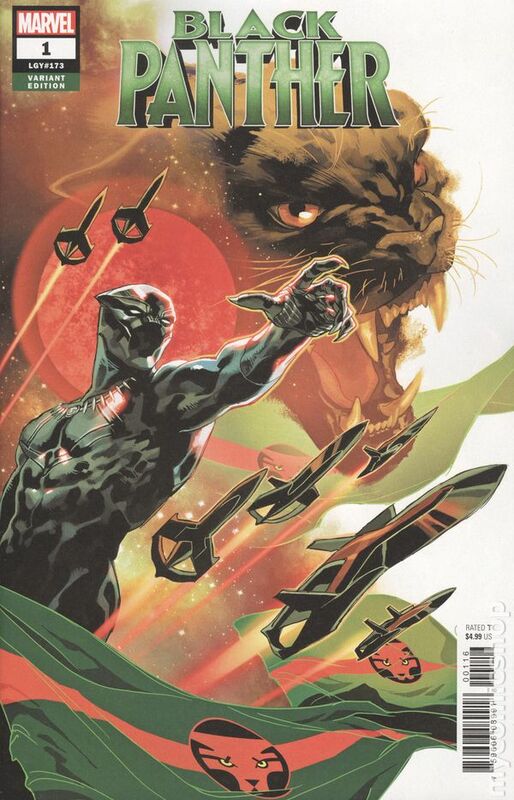 Journalist Evan Narcisse makes his comics debut alongside acclaimed writer Ta-Nehisi Coates as they chronicle T'Challa's rise to the throne - and to the Panther legacy that made him an Avenger. 28 pages, full color. Rated T Cover price $3.99. Movie Cover. Written by Ta-Nehisi Coates and Evan Narcisse. Art by Paul Renaud. SECRET ORIGIN OF THE BLACK PANTHER Part 1 Just in time for the highly anticipated film, witness the early years of the man who will come to rule one of the most scientifically advanced countries in the world! Wakanda has always kept itself isolated from Western society, but that's all about to change. 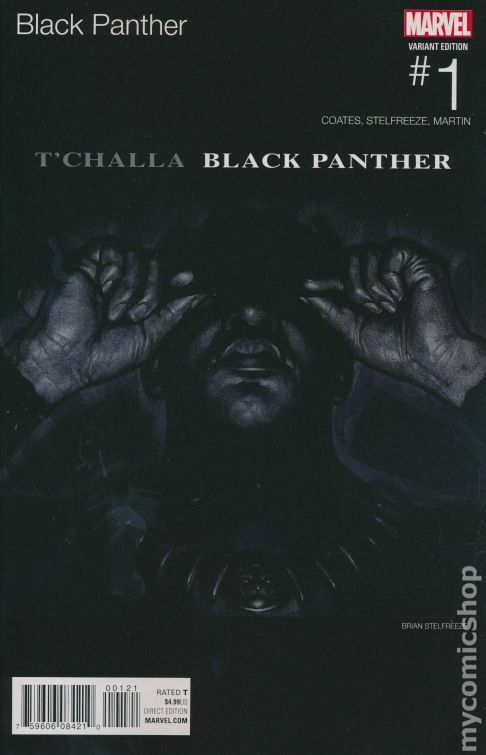 Young T'Challa knows he is destined to become king, but when his father is brutally murdered by outsiders, he'll find himself taking up a mantle he may not be ready for. Experience never-before-seen drama from the reign of T'Chaka, the king whose death changes a nation's history forever. 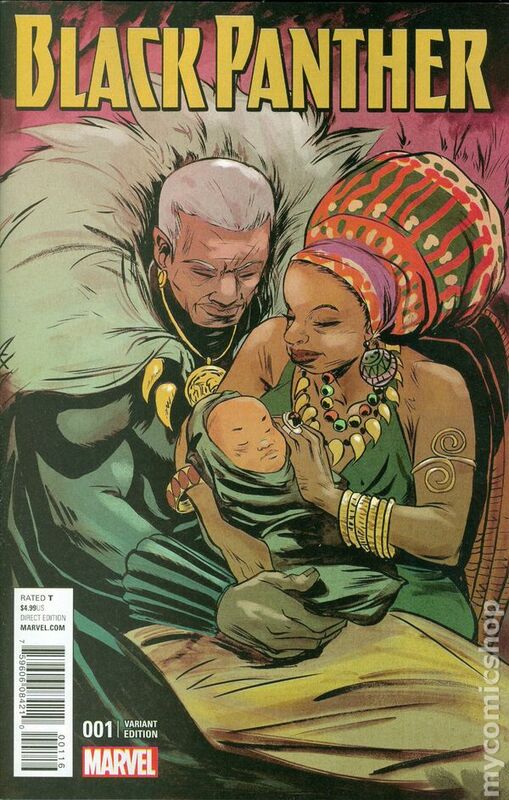 Learn about the mother T'Challa never knew. See how the world learns about this wondrous nation for the first time. Will the power of the Black Panther be enough to keep his country safe? 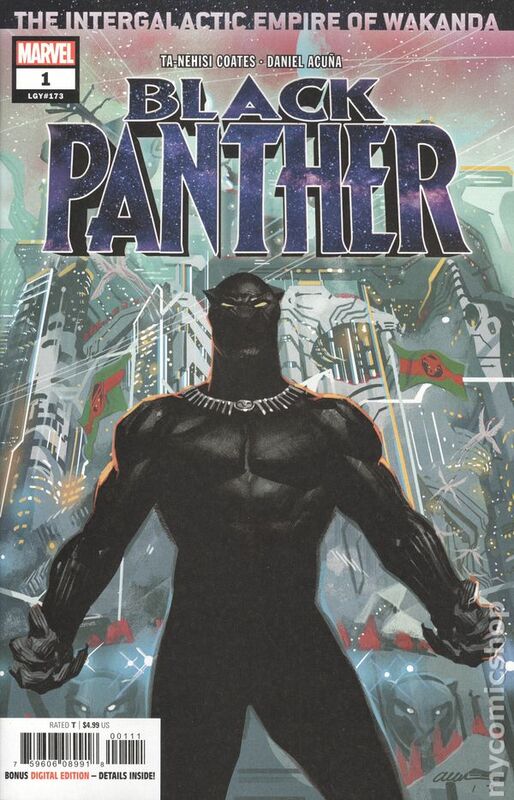 Journalist Evan Narcisse makes his comics debut alongside acclaimed writer Ta-Nehisi Coates as they chronicle T'Challa's rise to the throne - and to the Panther legacy that made him an Avenger. 28 pages, full color. Rated T Cover price $3.99.